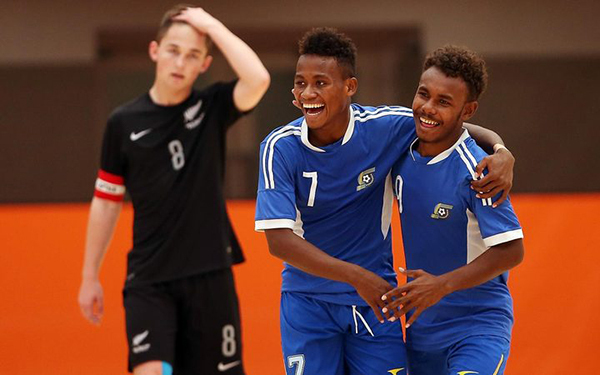 Solomon Islands are targeting futsal success at the Youth Olympics, which get underway in Argentina next weekend. But the Baby Kurukuru would have to overcome the so-called "pool of death" if they're to achieve their aim of reaching the medal rounds. Solomon Islands earned their ticket to Buenos Aires by winning the boys OFC Youth Futsal Tournament in Auckland last year. The Melanesian country also have athletes competing in weightlifting and athletics but Chef de Mission, Morris Maitaki, said the oval ball is their best chance for success. "And they did a lot of training here in Solomon Islands with a coach. Last month we sent (them) to Australia and they had some competition in Australia." "After they came back they joined a Honiara (futsal) league but also competing against senior teams like the Kurukuru - they fielded the senior Kurukuru (national men's team) as well as other very prominent clubs in Honiara," he said. Morris Maitaki said they're hoping the boys futsal team can advance past the group stage but admits it won't be easy against heavyweight opposition. "I could say it's a pool of death: Brazil and we are looking forward for probably (making the) second round and who knows, they are very confident and we look forward for good competition." Solomon Islands kick off their Youth Olympics campaign against Iran next weekend, with Russia and Costa Rica the other teams in their group.